San Tan Valley, once a part of Queen Creek, earned its name by its proximity to the nearby San Tan Mountains. San Tan Valley is currently working on becoming incorporated with the support of Pinal County. The area consists largely of master planned communities such as: Johnson Ranch, Ironwood Crossing, Pecan Creek South, Morning Sun Farms, San Tan Heights, Skyline Ranch, Copper Basin and Circle Cross Ranch. Residents visit the nearby San Tan Mountain Regional Park to enjoy more of the preserved outdoors. Like many of the cities in the Phoenix Metro, San Tan Valley has enjoyed consistent population and infrastructure growth. San Tan Valley residents benefit from modern amenities with a country feel. 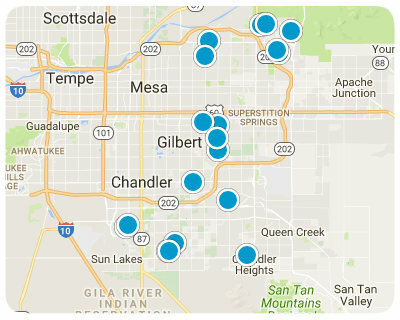 Below are ALL of the Homes for Sale and Recently Sold in San Tan Valley AZ from our Realtor MLS UPDATED EVERY 5 Minutes! That means EVERY home from EVERY Real Estate Company that is currently for Sale. You can also view ALL Homes for Sale in San Tan Valley, San Tan Valley Condos, San Tan Valley Foreclosures, San Tan Valley Short Sales, San Tan Valley Townhomes and Luxury homes in San Tan Valley. You can filter your search at the top by price, size, etc. Check out the popular 1-Click searches like San Tan Valley Homes for Sale with a Pool or Horse Property for Sale in San Tan Valley Arizona.